In 1960, at the age of 58, John Steinbeck decided that he’d been making a living writing about an America he no longer knew. He wanted to travel, to see the United States one more time as it now existed, to see if there was any such thing as the American People, to scratch the itch of wanderlust. He traveled in a specially fitted-out camper he named Rocinante, and he traveled with his dog, a standard poodle named Charley. Jenny: The only other book I’ve read by Steinbeck was The Grapes of Wrath, and that was 23 years ago! Since it’s been so long for me, I was ready for anything with this. I have to admit, I loved it from the very beginning. Steinbeck seemed to me to be open to any kind of adventure, ready for any type of discovery. He wasn’t embarking on this journey with preconceived notions of what he would find. Instead, he wanted to talk to individuals and see what portrait of America he could sketch through those talks. That’s just the kind of portrait I crave. Teresa: I read quite a lot of Steinbeck in high school but hardly any since. Still, it’s been ages, and I’d never read any of his nonfiction, so I didn’t know what to expect from this. What fascinated me was how his journey evolved. He said he was going to create a portion of America, but there were some points when we was too focused on getting to his next planned destination to do any observing. In a way, though, that sense of hurrying becomes part of the portrait—he was just experiencing it instead of observing it. Jenny: One of the reasons I wanted to read this particular work is that I like travelogues. I figured that even if the Steinbeck portion fell through, the travel part would be a pleasure. And even though Steinbeck didn’t fail me, the travel was wonderful! I enjoyed his thoughts about the travel itself — asking directions, avoiding big highways, stocking up for Rocinante — almost as much as his observations during his stops. One of my favorite scenes came early in the book, when he parked near a group of migrant Canadian workers in Maine. It resonated with The Grapes of Wrath, with its strong sense of the essential dignity of the people he was talking to, but it also had a rich vein of humor in it — and so did most of the book. Teresa: I don’t think of Steinbeck as a comic author, but he certainly was here. Travel stories bring out the humor, especially when the travel is unconventional and involves a dog! But for me, it was his treatment of the people he met that really stood out. He does seem to want to find the dignity within each one, at least until they prove themselves unreliable (like the veterinarian in Spokane) or just hateful (like the Southern racist he picked up). His desire to be always respectful impressed me most in the section on the South. It was deeply uncomfortable to read about women shouting hateful invectives at children going to school and white men openly saying they’d happily kill a black man. Shocking, really, and Steinbeck is clear about how wrong this is. But he also sees the conflict within so many individual Southerners of the time. The frank conversation between him and “Monsieur Ci Gît,” followed by his attempt to talk with the black man he picked up on the road, got at just how deep-seated the pain and fear were for all these people living “in the meanwhile,” waiting for a future yet to come. Jenny: That section stood out for me, too. Steinbeck wasn’t proposing answers, and he wasn’t suggesting that he had a complete picture of what it meant to live in the South. But it was a pretty vivid portrait, just the same, from a very troubled time in our history. Just imagine — he saw Ruby Bridges! And his ability to understand what he was seeing came from a place of real compassion, which I think he brought with him wherever he went. Whether he was thinking about the rootlessness of Americans and their mobile homes, or the fear that prompts people to name a road an “Evacuation Highway,” or the way a man must feel who has to kick someone off private property, he seemed genuinely able to look at a situation and see into the heart of it. I came away feeling that Steinbeck was a generous person. I would be really curious to know what he’d see if he made such a trip today. Teresa: I have to mention how exciting it was for me to read his impressions of mobile homes, since I grew up in one myself. It couldn’t have been more than 10 years after Steinbeck wrote this that my parents bought our home and set it up right next to my grandparents’ house, just as Steinbeck described. It reminded me that in some small way, all Americans are part of the larger story of our country. As for what he’d find today, that’s a good question. Plenty of the same fears remain—his conversation with the Canadian workers seemed eerily relevant. We’ve made progress (although not enough) when it comes to race, but now we have the equally hateful anti-gay demonstrations. So much has changed, but so much has not. 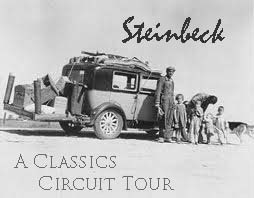 We read this book as part of the Classics Circuit tour celebrating the work of John Steinbeck. Look for the itinerary of the rest of the tour and for sign-ups for future tours at the Classics Circuit website! This entry was posted in Classics, Memoir, Nonfiction, Travel/ Exploration. Bookmark the permalink. I’m so glad you both liked this one. It’s one of my absolute favorites. Steinbeck has a reputation for writing some heartbreaking books (Of Mice and Men, East of Eden, Grapes of Wrath), but he also had such a wonderful talent for capturing the humor and joy in American life. I love that he just picked up and went on this trip because he was feeling disconnected from America. I loved that, too. I don’t remember much humor in The Grapes of Wrath, but I almost think he couldn’t help but infuse some of that in his observations. Travels with Charley is the book I read in the 11th grade that made me become a writer. It was the first non-fiction book that I read that wasn’t a textbook. It deeply affected me; not only the story but the fact that it was written from personal experience. A revelation to me. I have a hardback copy (copyright 1962) sitting on my bookshelf. I reread it a few years ago — something I had put off for I was afraid the story might have dimmed. But no. It was a delightful as ever. I had also put off rereading it as I didn’t want to spoil the memory of the feelings that it stirred in me in high school. Rereading it led me to a book of Steinbeck’s essays titled America And Americans. Sadly, I have given it away in one of my book purges. What a great story! In Stephen King’s book Desperation, a writer character considers writing about traveling on his motorcycle and calling it Travels With Harley — but then he abandons the idea because he’s not as good as Steinbeck. Now I know why! I didn’t know he saw Ruby Bridges! Actual real-life Ruby Bridges? That’s so cool, Ruby Bridges is such my hero. I love that he had a poodle — I think of him as one of those frontiersy sorts of writers, the kind of guy who would have a St. Bernard or a mastiff or something. But poodles are, of course, the best dogs of all the dogs. I had to figure it out, but yes — he’s in New Orleans, and he goes to visit the school and sees the little girl going in all alone, and then the one white father bringing in his child. He doesn’t name the girl, but it’s Ruby Bridges for sure. (One of my heroes, too.) And I agree about the poodle. It surprised and charmed me. It absolutely is about context, Rebecca. I think, as Teresa said, the part about the immigrants is especially timely. I marked it for re-reading. The only Steinbeck I’ve read is Of Mice and Men. This review makes me want to read more of his work, especially Travels with Charley! Great review. Oh, it’s lovely! It made me want to read more of his, too, maybe starting with East of Eden or Of Mice and Men. This is such a phenomenal little book. I also really loved the section on the mobile homes. Considering I don’t see that in my area of the country, it was interesting to get his perspective. But for me, the strongest section of the book was that on the South. I like that he didn’t shy away from the issues and purposely went there to see what was going on. Simply amazing! Great review! I think the section on the South was the most striking because of the way he stayed away from judgment (except on obviously hateful behavior) and tried to be compassionate to people who were really in pain and trouble. It’s rare to find that. I really need to read The Grapes of Wrath this year, it’s been sitting on my shelves forever. I loved The Grapes of Wrath when I was in high school. I’d be curious to know how I’d react to it now. Thanks for the recommendation for the center! I’m glad you both loved this one as much as I did. I didn’t know anything about John Steinbeck the person before reading it but he comes over as being a really lovely and thoroughly decent person. I hadn’t even heard of Ruby Bridges as it’s not part of my history, I’m in Scotland, but I googled cheerleaders and little schoolgirl in Louisiana and got straight to her. It must have been horrendous for her. At least things aren’t as bad as that now. Steinbeck the person was one of the most impressive things about the book, I thought. I had heard all about Ruby Bridges, but I didn’t immediately recognize the story as being about her until I looked it up. Sadly, there were so many horrible stories about school desegregation that they’re a bit of a blur in my mind. But hers is one of the most famous. I hope I can read this one soon. I went to the Steinbeck museum once and I can picture a big map of the route Steinbeck took, and I think they had the actual camper that he used. It was pretty cool. It would be soooo cool to see Rocinante. If I’m ever out that way, I’ll be sure to put the museum on my list. I have got to read this book. Since the Classics Circuit has rekindled my love of Steinbeck and since I also enjoy armchair travelling, this is a perfect fit. >It reminded me that in some small way, all Americans are part of the larger story of our country. I think this is what separates Steinbeck from lesser authors–enabling people to recognize themselves, their lives, their history in society is truly a talent and a responsibility that Steinbeck took seriously. I’m reading a short bio of Steinbeck and it’s interesting to learn of his friendship with Joseph Campbell and how this friendship may have impacted the work of both with regards to the power of mythology and our shared cultural past…and present. You’re right about that. I think his ability to see the larger picture in each person he met and the small details of each large picture is a rare talent. This is the second review of a Steinbeck book that I’ve read today on my Google Reader, which just means I need to pick up a book of his soon. I haven’t read him since college. Now it’s a toss-up as to whether I want to read East of Eden or Travels with Charley first. I think East of Eden will be next for me!